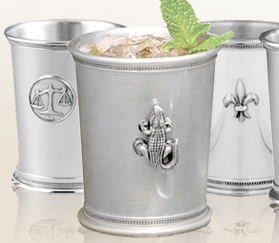 krismulkey.com: Mint Julep. The signature drink of the Kentucky Derby. Mint Julep. The signature drink of the Kentucky Derby. So if you find yourself watching the race, here's the same cocktail all the ladies and gents will be sipping at the track. The classic Mint Julep. I love the way the bartender in the attached video gets the ice to crush into ice powder. He puts ice cubes in a canvas bag and beats them with a big wooden mallet. I have got to try that at home. (Talk about a free therapy session!) I just told Don and he said, "we can buy crushed ice." Hmm. I'm buying a bag and a mallot! Here's a video to show you how to make it. Click here. Of course the bartender serves it in a really cool pewter cup. That's it. Have a good weekend everyone! Click here to order cool cups for next year!